We’ve all heard about the #Ice Bucket Challenge, but are you familiar with the “Gratitude Challenge”? This was making the rounds on Facebook a few months back. A friend would tag three of their friends to post three things they are grateful for each day for three days (apparently there were also 5 and 7 day challenges as well). This got me thinking that during the U.S. Thanksgiving season, it might be a good time for non-profits and charities to, as Pamela Grow has suggested (in this month’s Nonprofit Blog Carnival call), develop “an attitude of gratitude”. Up for an "organizational gratitude challenge”? Why not challenge each department, your staff and even your board members to think of three new ways to show your gratitude to your donors, supporters and volunteers? 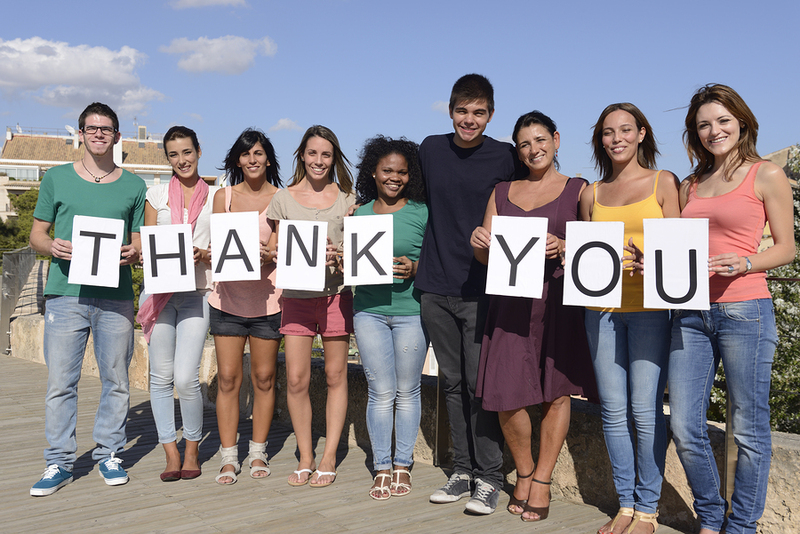 When was the last time you called your donors to say thanks? As Pamela Grow noted in a post a while back, “it isn’t just the feel-good aspect of donor thank you calls that make them important. ...A study by the UK firm Pell & Bales found that thank you calls reduced donor attrition by a third." This can be as simple as having your fundraising team set aside time each week to call recent donors, or as elaborate as a yearly Thank-a-thon with the help of your staff and board. Have you celebrated your supporters via social media? Social campaigns can be a great way of saying thanks and garnering additional awareness. What about launching a “Thanks-for-giving” campaign on your Facebook page? Do you have any upcoming events at which you can make it personal in person? Consider taking photos of supporters as they arrive at your event or as they make their pledges during the silent auction etc. Then you can share these on screen at the event and also on your blog, on social media channels, etc. (Remember to have those taking the photos capture the names of the supporter if possible). Are you thanking and recognizing your volunteers? Offer recognition awards (these can be great for volunteers to include on their resumes, or social profiles). Start a volunteer hall of fame (in your office or on your website). You ask your board members to fundraise and thank supporters, but are you recognizing their efforts? Go beyond just having the board’s photos and names in your annual report and on your website. Consider recognizing their specific efforts, e.g., the number of personal thank you calls made in a year; the number of events they’ve hosted; the number of sponsors they’ve brought in, etc. Perhaps your organization is already doing a fantastic job of celebrating, recognizing and thanking your donors, supporters and volunteers. If that’s the case, perhaps this holiday season your “gratitude challenge” could simply be finding ways of capturing, documenting and better promoting all of the celebrations, recognition and thank-you’s. If you take on an "organizational gratitude challenge” this season, please share your efforts and ideas in the comments below.